A sympathetic block is a procedure in which sympathetic nerves are blocked in order to relieve various types of pain, especially chronic pain that has not improved after treatment with pain-relieving medication or injections. A sympathetic block may also be recommended for cases where treatment with medication or injections has caused serious side effects. 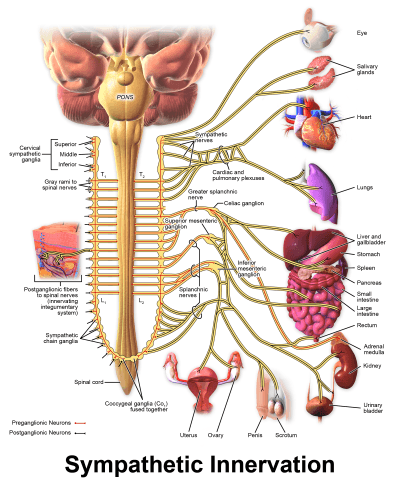 Sympathetic nerves originate along the spinal column and extend to all smooth muscles and glands within the body as well as the muscles of the heart. These nerves send and receive signals throughout the entire body and are responsible for numerous functions such as regulation of the heart rate, respiration, digestion, bodily and facial movements, and perspiration. The sympathetic block has been successfully utilized to treat pain in various parts of the body such as the head, neck, back, and tailbone, as well as the upper and lower limbs. Once the area where the pain is originating from is determined, nerves specific to that region can be blocked in order to reduce pain. The sympathetic block procedure involves inserting a needle through the skin and tissue near the region where the affected sympathetic nerves are located, followed by placing a catheter through the needle. Contrast agents and imaging equipment are used to ensure proper placement of the needle, and then either an anesthetic or an agent that disintegrates nerve tissue is administered to alleviate pain. The needle may be inserted anteriorly with the patient lying on their stomach, transdiscally with the patient lying on their side, or posteriorly with the patient lying on their back. The posterior approach, which involves inserting the needle near the buttocks and directly below the spine, is the most common method as it poses the lowest risk of injury to spinal discs, nerves, arteries, and veins. Though there is a risk of injury to certain nerve roots, arteries, or veins, this risk is minimal since imagining techniques are used during the placement of the needle. Imaging techniques include computed tomography (CT imaging), fluoroscopy, x-ray imaging, or ultrasound. CT imaging is the least commonly used method as it exposes the surgeon and patient to high levels of radiation. Complex regional pain syndrome is chronic pain that occurs in the arm or leg following surgery, an injury, a heart attack, or a stroke, and is characterized by pain that is significantly more intense than the severity of the injury or circumstance that led to it. It is often hard to determine the exact cause of this syndrome which, in turn, makes it difficult to treat, but nerve damage is typically believed to be responsible for the pain. 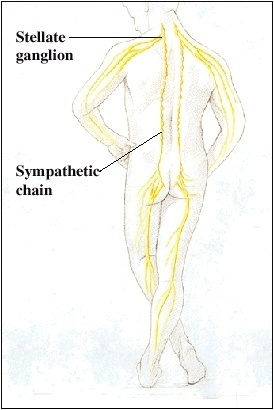 The sympathetic block is effective at reducing the intensity of pain, which supports the notion that this syndrome may be the result of nerve damage. This procedure is often recommended for chronic pain that may originate in different parts of the body (e.g., head, neck, back, or limbs), especially when anti-inflammatory agents, pain-relieving medications, or injections are ineffective at reducing pain. In many cases, a successful sympathetic block leads to a significant reduction in pain and often decreases or completely eliminates the need to continue taking medication. The initial form of treatment that is typically used for cancer-related pain may involve a combination of non-steroidal anti-inflammatory agents, pain-relieving medication, and antidepressants. This type of treatment does not always improve symptoms and may even cause intolerable side effects for some patients. When patients facing these circumstances undergo a sympathetic block, significant pain relief is generally reported in addition to a decrease in the need to use prescribed medication. Improvements in mobility and well-being are also typically reported. The sympathetic block has even been used to treat neuropathic pain that develops as a result of brown recluse spider bites, which can cause nerve and tissue damage. Performing the block through the use of an anesthetic has been shown to reduce pain and improve tissue damage. 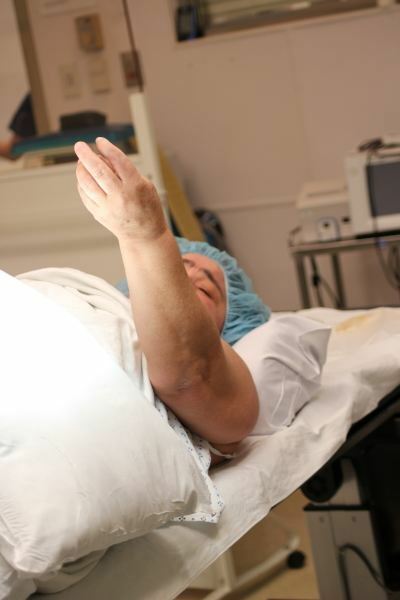 Overall, this is a brief procedure that generally provides patients with dramatic pain relief that begins during the first 24 hours and lasts for long periods of time. The ability to block nerves specific to certain regions also makes this treatment method optimal for pain management. A sympathetic block is a form of pain treatment that entails blocking specific sympathetic nerves that may be contributing to pain that is experienced in certain parts of the body. Sympathetic nerves extend to all muscles and glands of the body and determining where pain may be originating allows a surgeon to perform a block on nerves specific to the affected region in order to alleviate the pain. The procedure entails inserting a needle and catheter through the skin and tissue, followed by the administration of chemical agents such as anesthetics or nerve-disintegrating agents that reduce pain. 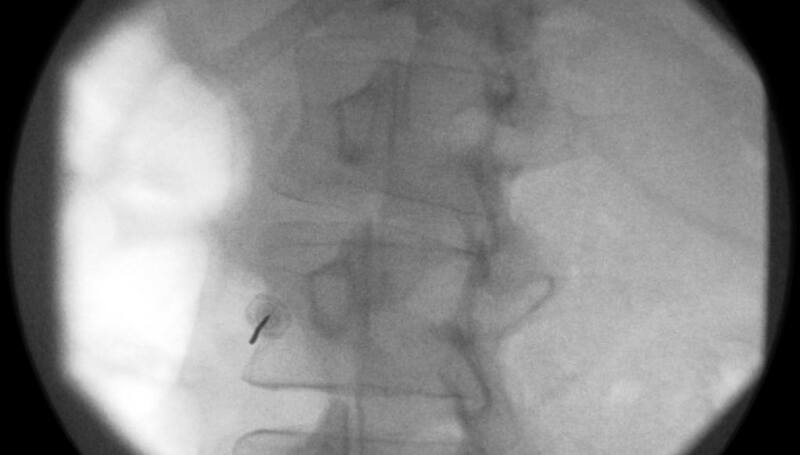 Risks associated with this procedure include potential injury to nerve roots, spinal discs, arteries, and veins, but this is typically avoided through the use of imaging techniques during needle placement. Blocking sympathetic nerves in this manner has been shown to be quite effective at reducing pain, especially when prior treatment with pain relievers and injections have been unsuccessful or have caused serious side effects. The results are generally long term and most patients can either stop using pain medication or take a significantly lower dose after receiving a sympathetic block. Carroll I, Clark JD, Mackey S. Sympathetic block with botulinum toxin to treat complex regional pain syndrome. Ann Neurol. 2009;65(3):348-351.
de Oliveira R, dos Reis MP, Prado WA. The effects of early or late neurolytic sympathetic plexus block on the management of abdominal or pelvic cancer pain. Pain. 2004;110(1-2): 400-408. Gebauer A, Schultz CR, Giangarra CE. Chronic exercise-induced leg pain in an athlete successfully treated with sympathetic block. Am J Sports Med. 2005;33(10): 1575-1578. Nordmann GR, Lauder GR, Grier DJ. Computed tomography guided lumbar sympathetic block for complex regional pain syndrome in a child: a case report and review. Eur J Pain. 2006;10(5): 409-412. Stanton TR, Wand BM, Carr DB, Birklein F, Wasner GL, O’Connell NE. Local anaesthetic sympathetic blockade for complex regional pain syndrome. Cochrane Database Syst Rev. 2013;8:CD004598. Yi X, AuBuchon J, Zeltwanger S, Kirby JP. Necrotic arachnidism and intractable pain from recluse spider bites treated with lumbar sympathetic block: a case report and review of literature. Clin J Pain. 2011;27(5): 457-460.